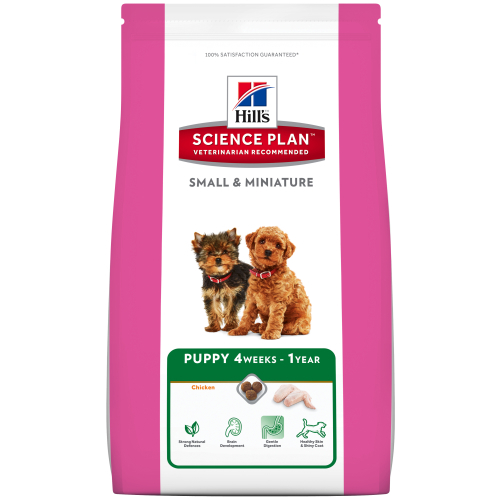 Science Plan™ Puppy Small & Miniature is formulated to support immunity and healthy development of brain, muscles and bones. With high levels of clinically proven antioxidants and DHA from fish oil. Dried chicken and turkey (chicken 36%, turkey 4%, total poultry 54%), maize, wheat, animal fat, digest, brewers’ rice, maize gluten meal, beet pulp, minerals, fish oil, flaxseed, tomato pomace, spinach powder, citrus pulp, grape pomace, vitamins, trace elements, taurine and beta-carotene. Naturally preserved with mixed tocopherols and citric acid. Beta-carotene 1.5 mg/kg, Calcium 0.0133, Carbohydrate (NFE) 0.369, Copper 10 mg/kg, DHA 0.0016, DHA +EPA 0.0038, Fat 0.191, Fibre (crude) 0.018, Magnesium 0.0009, Omega-3 fatty acids 0.0093, Omega-6 fatty acids 0.0278, Phosphorus 0.0107, Potassium 0.0075, Protein 0.278, Sodium 0.0047, Vitamin A 6914 IU/kg, Vitamin C 105 mg/kg, Vitamin D 661 IU/kg, Vitamin E 690 mg/kg, Zinc 159 mg/kg.